What Do Institutional Investors Want from Their Hedge Fund and Private Equity Portfolios? Institutional investors are a vital source of capital for the alternative assets industry and, as the industry matures, private equity and hedge funds have come to play an increasingly important role in investors’ portfolios. Preqin’s Private Equity Online and Hedge Fund Online track over 6,200 institutional investors in private equity and over 5,000 investors in hedge funds respectively. Currently institutional investors tracked by Preqin are under-allocated to both asset classes: institutions investing in hedge funds have an average current allocation of 13.8% compared to an average target allocation of 14.2%, whereas those investing in private equity have an average current allocation of 9.8% compared to a target of 10.9%. 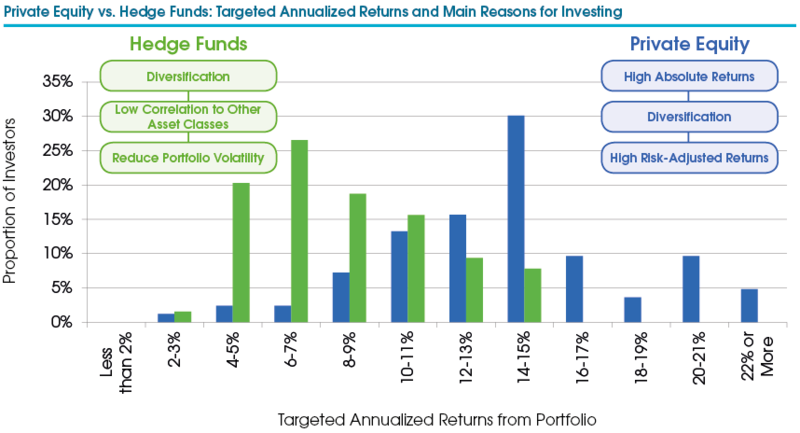 Preqin surveyed institutional investors about their targeted returns and main reasons for investing in hedge funds and private equity (see chart above); the full results of this study are presented in the Preqin Investor Outlook: Alternative Assets H2 2015. Investors typically have more ambitious return targets for their private equity allocations compared with their hedge fund investments: the median target return for investors in private equity was in the 14-15% range, as opposed to 8-9% for hedge funds. The prospect of high absolute returns was the most commonly cited reason for investing in private equity, followed by diversification and high risk-adjusted returns. By contrast, institutional investors placed less emphasis on absolute returns in relation to their hedge fund investments, instead concentrating on the role that hedge funds play in diversifying portfolios and reducing portfolio volatility, alongside their low correlation to other asset classes. Against these expectations, the two asset classes have had different levels of success. Private equity funds have tended to be successful in meeting the high absolute return targets – horizon IRRs for all private equity strategies stood at 16.2% for the three years to June 2015, 15.4% for five years and 16.1% for 10 years. In contrast, hedge funds have tended to fall towards the lower end of investors’ target range in recent years – as of Q1 2016, the Preqin All-Strategies Hedge Fund benchmark posted an annualized three-year return of 4.53% and a five-year return of 4.73%. Only over 10 years does the benchmark come close to the 8-9% median target of investors, with a 10-year annualized return of 7.81%. Nevertheless, while recent performance has fallen short of targets, a significant number of investors will continue to allocate to hedge funds due to the portfolio benefits detailed above. Of the investors interviewed for the Preqin Investor Outlook: Alternative Assets, H1 2016, 74% plan to maintain or increase their allocation to hedge funds over the long term. In recognition of their recent strong performance, however, private equity looks set for even stronger growth, with 94% of investors planning to maintain or increase their allocation, including 52% that plan to increase their allocation to the asset class.